The internal components and structures of boiler water reactors (BWRs) usually suffer the problem of intergranular stress corrosion cracking (IGSCC). Core shroud is one of these structures. Many BWR nuclear power plants have reported the finding of IGSCCs around heat affected zone (HAZ) of core shroud weldments. In order to assure the integrity of the internal components of reactors, in-vessel visual inspection (IVVI) is performed during each outage of a reactor unit. Most IGSCCs were discovered initially by IVVI, and then inspected by automatic ultrasonic testing (AUT) system to confirm the length and measure the depth of the cracks. 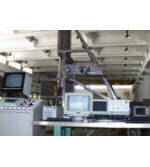 In this project, an OD tracker was built for the scanning of ultrasonic testing. A weld test piece with surface cracks near HAZ was mounted on a core shroud mock-up. These cracks were implanted thermal fatigue cracks, which were used to simulate IGSCCs. The self-developed ultrasonic testing software was used to control scanner, acquire data, display and analyze inspected images. The obtained inspection results were satisfied. Core shroud of a BWR, as shown in Figure 1, is a cylinder inside the reactor pressure vessel (RPV) and surrounding the reactor core. 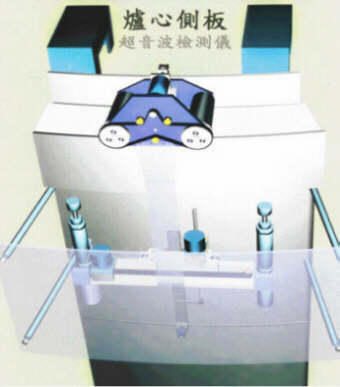 The primary functions of the shroud are to guide the flow of coolant up through the core and to provide support for the top guide, steam dryer, and core spray assembly. The shrouds were made of stainless steel with vertical and horizontal welds. Since 1990 circumferential crack indications have been observed in many BWR core shroud assemblies during refueling outages as a result of extensive ultrasonic and visual inspections [1-5]. The cracks usually locate in weld heat affected zone on either outside or inside surface of circumferential or vertical shroud weld. The flaw mechanism was identified as IGSCC. With the experience of many nuclear power plants, IVVI, AUT and ET are recognized as effective methods for core shroud IGSCC inspection. This project has being conducted to develop an AUT system for the detection and sizing of core shroud IGSCC. 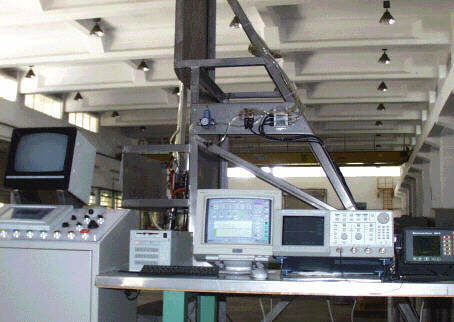 A picture of this automatic ultrasonic testing system is shown in Figure 2. This system consists of OD tracker, scanning controller, ultrasonic instrument, transducers, A/D converter, personal computer and in-house developed software. The OD tracker, as shown in Figure 3, was designed to be installed on the top of the shroud flange and to inspect the weld from the outside surface. 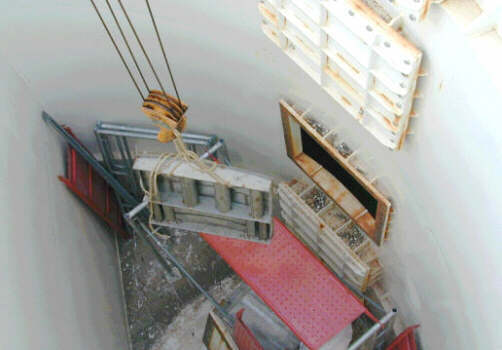 Driving by a stepping motor the two rollers, which were installed on the top, could carry the tracker to the approximate circumferential position. Then two hydraulic operated bars could fix the tracker by pushing the outside surface of shroud and inside surface of RPV horizontally. This action could provide a stable motion for the two-axes fine motion scanner, which was installed in the middle part of the tracker. This scanner could hold a transducer scanning vertically and horizontally around the inspecting weld. Once finding the shroud weld IGSCC, the size of the crack is usually required for further evaluation. Many inspection teams organized by nuclear companies have been developing and improving the transducers used for detection and sizing. For the recent years, 45o shear wave (45S), 60o refracted longitudinal wave (60RL) and creeping wave (CR) transducers were often reported as the best combination set. These were also the transducers used in this project. The 45S transducer was designed to detect the cracks on the scanning surface or opposite surface, and to confirm the detection and sizing results obtained by 60RL transducer. The 60RL transducer was used for detecting and sizing the cracks located on the scanning surface and opposite surface. It could also penetrate through the weld to inspect the cracks at the other side of the transducer. The creeping wave transducer can be used to detect shallow cracks on the same surface of the transducer by OD creeping wave, and to detect the cracks on the opposite surface by ID creeping wave if both surfaces are parallel. The frequency of the transducers used was 2.25MHz. The personal computer and developed software were used to integrate the various components into a measurement system. A high sampling rate, 100 MS/sec, data acquisition card was installed in the PC to initiate sampling and digitize the sampled analogue signal. The digitized signal can be processed by the software and the results can be displayed as A-scan, B-scan and C-scan images during the scan. Because the ultrasonic signal from the stainless steel weld is noisy, further signal processing is necessary. Beside the commonly used processing methods, such as averaging and spectrum analysis, wavelet transform, was built in the system. It is a time-frequency analysis method that can analyze signal in both the time and frequency domains. Split spectrum processing method was also built to delete most noises scattering from the coarse grains of weld. A sectioned (120o) core shroud mock-up, with the same outside diameter but less height as the core shroud of a nuclear power plant, was built by this project. Adjacent components of core shroud, such as RPV and jet pumps, were installed to simulate the narrow space near core shroud welds. A weld specimen, as shown in Figure 4, was also mounted on the shroud mock-up for the development of AUT system and inspection procedure. This weld specimen was designed to meet the material and welding technique used in the shroud. Three thermal fatigue cracks were planted on the HAZ surface of this specimen. Although it would have been preferable to have specimen that containing actual IGSCC, it was not practical to give laboratory production of IGSCC. However, thermal fatigue cracks were precisely controllable in their shape and dimension. The width dimension of thermal fatigue crack's opening is similar to that of IGSCC. 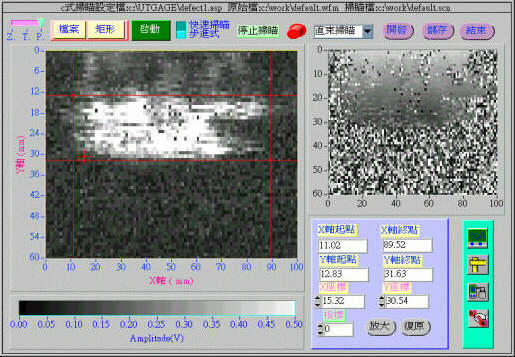 The ultrasonic response obtained from thermal fatigue crack is also similar to that from IGSCC. Figure 5 is an AUT result of a crack located on the mentioned specimen. Left image is a C-scan of signal amplitude while the right image is a C-scan of signal TOF (time of flight). The white area on left image represents a crack indication. With the scale on X-axis of this image and the cursor lines, the length of the detected crack can be evaluated directly. The built AUT system has obtained satisfied result from core shroud weld mock-up. In order to set up the capability of performing real inspection in nuclear power plants, firstly it has to improve the found problems of this system. Training of the inspection team members, including the operation of tracker and evaluation of ultrasonic signal, is an urgent work. This project is planning to make an ID scanner to inspect IGSCC from the inside surface of core shroud. Besides, the capability of handling and storage of contaminated tools and instruments also has to be improved. NRC-IN-93-79, "Core Shroud Cracking at Beltline Region Welds in Boiling-Water Reactors", September 30, 1993. NRC-IN-94-42, "Cracking in the Lower Region of the Core Shroud in Boiling-Water Reactors", June 7, 1994. NRC-IN-94-42 Sup.1, "Cracking in the Lower Region of the Core Shroud in Boiling Water Reactors", July 19, 1994. NRC-GL-94-03, "Intergranular Stress Corrosion Cracking of Core Shroud in Boiling Water Reactors", July 25, 1994. NRC-IN-97-17, "Cracking of Vertical Welds in the Core Shroud and Degraded Repair", April 14, 1997.